CiviCRM Sprinters Push Soft Credit Improvements Forward! Coming off of CiviCon North America 2013, 25 members of the CiviCRM community spent a week at the Woolman Center working on new functionality, creating documentation, and discussing how to grow the CiviCRM community. Based off initial seed funding of the Soft Credit Improvements Make-it-Happen by San Francisco Baykeeper, we fielded a team of five developers to begin development. As of yesterday, a significant chunk of Phase 1 of the Make-it-Happen is complete, and is now in a quality assurance phase to be released with CiviCRM 4.4 later this year. We are still looking for funding to complete our wishlist for 4.4. If improved soft credits is something you would like to see in your CiviCRM, you can make it happen. 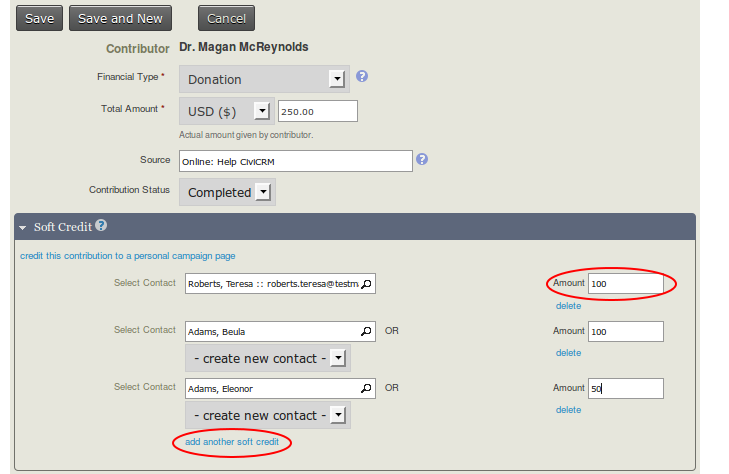 Include soft credits in several key built-in contribution reports. In addition, at the sprint we created a suite of unit tests, to help keep the soft credit functionality remain bug-free, and built a new soft credit API, to help developers use soft credits in sophisticated imports and connections to other applications. This MIH hasn't been fully funded yet - but there's still time! If funding comes through by June 16th, we can fully implement Phase 1, which would also allow users to search for soft credits in Advanced Search / Find Contributions. If this is a functionality that your organization or clients would benefit from, please allocate funding toward this MIH ASAP! Notes on the MIH specification can be found on the CiviCRM wiki here. FYI: http://give2gether.com has made a business model out of soft-credit for events, etc. Note that the Personal Campaign Pages are much slicker but nothing civi couldn't do. They also have awards and tiers, etc.